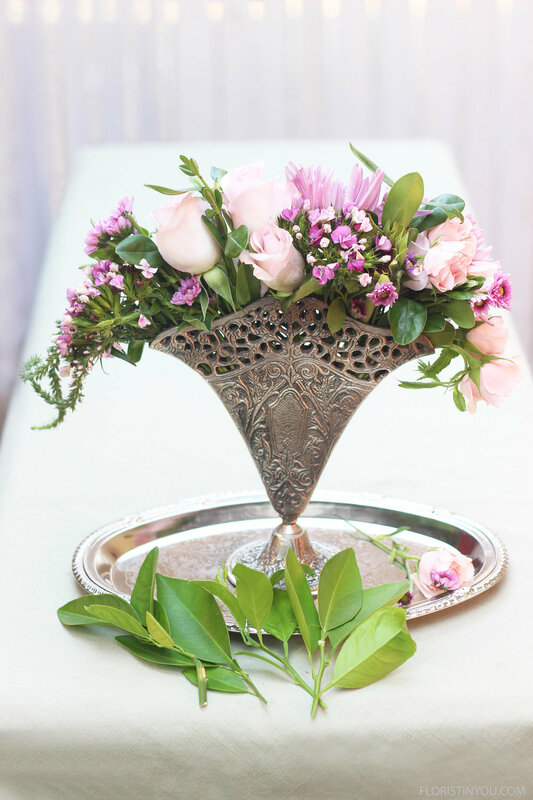 Would you like to make a charming floral centerpiece in a vintage silver fan vase? This small bouquet comes already put together. 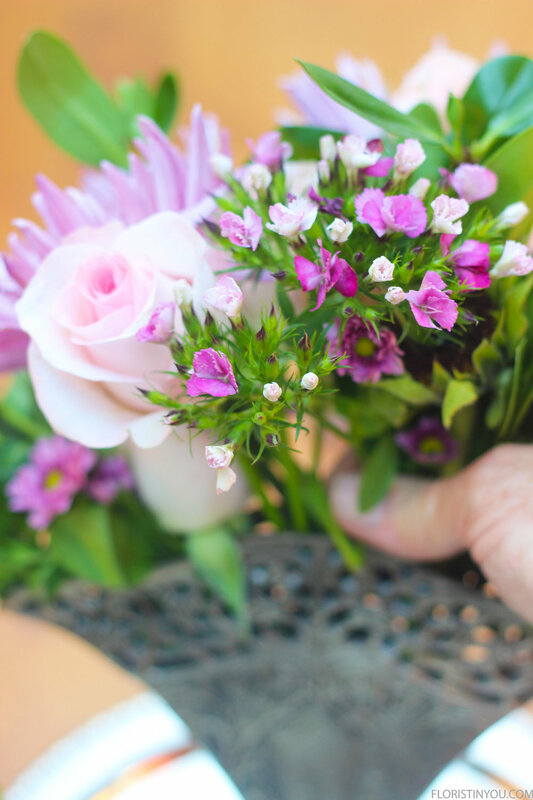 It has small baby pink Roses, lavender Spider Mums, lavender mini Mums with green centers, lavender Gypsy Dianthus (small multiple blooms), and the long wispy lavender Veronica. I added a few Lemon Leaf that I cut from my garden. The flowers in the bouquet are tiny and delicate and the lavender color is beautiful paired with this vintage silver fan vase. Thank you Silvia, for the use of your fan vase. The silver fan vase was actually designed as a piece of decorative art by Ernest T. Beck in 1927, and then copied by Godingers in 1991. The fan vase has been employed as a vase and a napkin holder. When you buy one you are really using a work of decorative arts for flowers. Ernest T. Beck was the German designer who created this style of fan vase for Forbes Silver Co,. a department of Meriden Britannia Co. It was designed in 1927 during the Arts and Crafts period and has a strong Art Nouveau influence. Beck was influenced by the Jugendstil design movement in Germany. Jugendstil, which means "youth art" emerged in Germany in the 1890's and went through WWI. It encompassed the design style Art Nouveau which means "New Art"... (think Paris subway entrances) and became popular during the 1900 Exposition Universelle in Paris. This style was seen in architecture... (think Victor Horta: the Art Nouveau Staircase in the Emile Tassel House, in Brussels, and Antoni Gaudi: Casa Mila [my favorite with its undulating curves] and Sagrada Família in Barcelona Spain). It was also seen in fine art, decorative art (the ornamentation of functional objects like this fan vase) and the larger category of applied arts, of which decorative arts is a part of. If any of you have seen these in person, please comment below. If you'd like, you can attach a photo. Godinger Silver Art Co, an American company founded in 1973 that specializes in silver, thought highly enough about this little gem to bring it back and make a replica. You can find both the original 1927 version of the silver plated fan vase as well as the Godinger 1991 replica on ETSY. 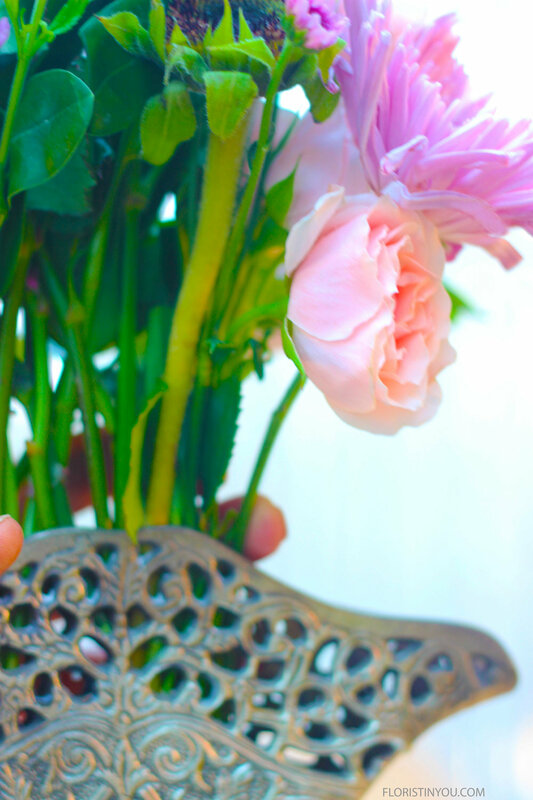 If you have your silver fan vase and your petite bouquet, let's begin. Here are your flowers, vase and materials. 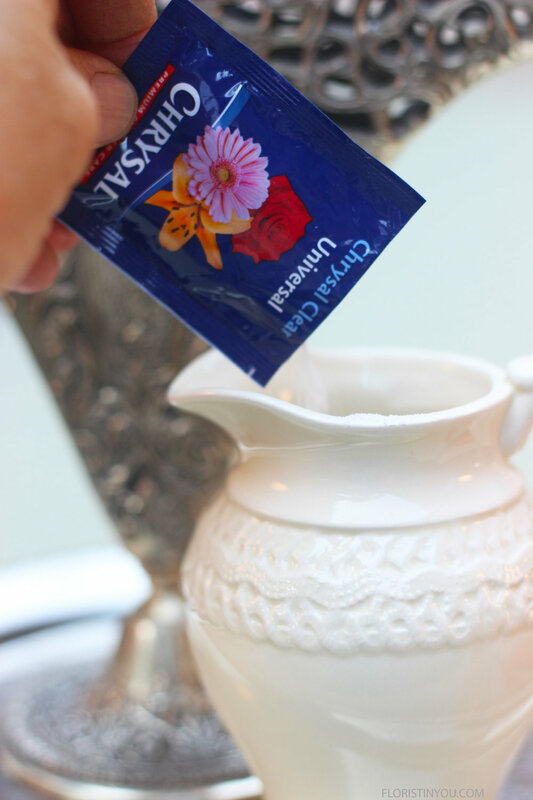 Add a packet of floral food to the water. Pour into the vase til it's 1.5 inches below perforations. 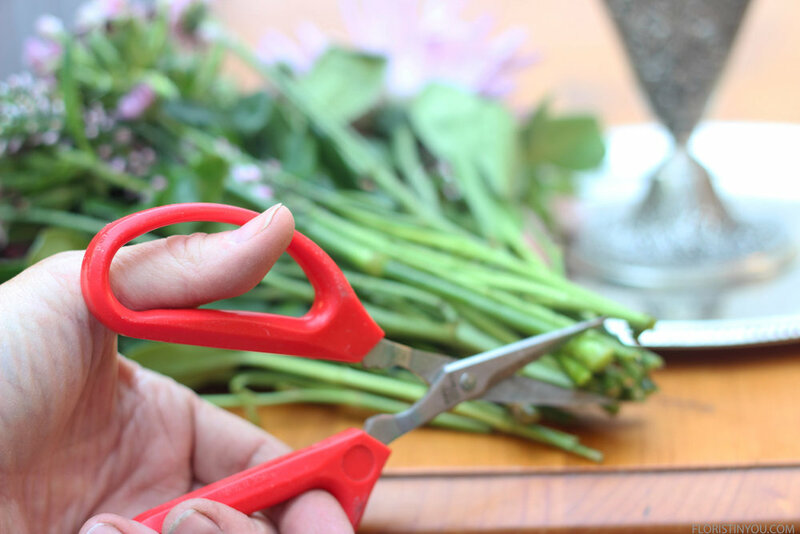 Cut stems on a 45 degree angle. Blooms should be above the rim. Add a few pieces of Lemon Leaf or other greens where needed. The Veronica can trail out one side. The Veronica has undulating curves just like the lines in Art Nouveau. Note the intricate floral scroll work on the fan vase. Close ups of Veronica, Gypsy Dianthus, and Roses. Spider Mums on the right. Mini Mums on the left. Mist the flowers and add water when low. Voilà! It is compete. Enjoy.